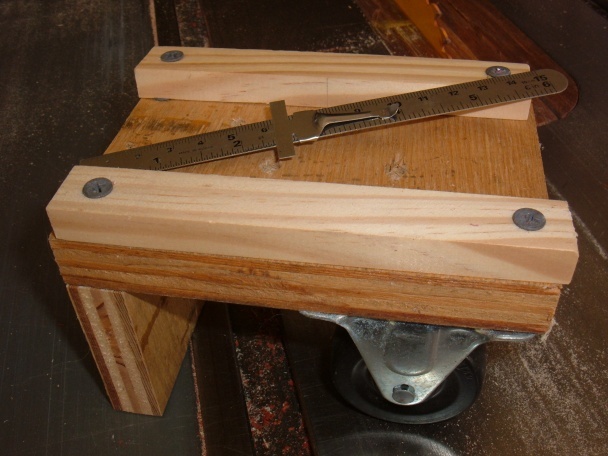 Woodworking Talk - Woodworkers Forum > Shop Talk > Tips, Tricks, & Homemade Jigs > What can you do with this? Every year, at my age, plywood gets heavier exponentially. Ply stored on it's edge in the rack can be moved easily by putting this PATENTED(not really) device near the center of gravity. Wondrous manuverability. And doesn't take up much room. Are there one or two casters underneath it? Looks pretty simple, and I like the "brake" on there as well. I used to be fairly indecisive, but now....... I'm not so sure. There are 2 casters. The "brake" is just to keep it from flopping around while you're placing the ply on it. I've used it to move a 5 gallon bucket of sand amongst other fairly heavy stuff. I'm not young anymore (36) really but truly I've been far too abusive to my body with work and play that I'm finding it not much fun carrying heavy loads around like plywood or any sheet goods for that matter. Am actually finishing my bathroom right now and about a week and a half ago my wife and I, mainly I, put up a cut down 10' to 9' 4' wide 5/8" thick sheet rock on an 8' tall ceiling. Let me tell you that THAT really sucked the life out of me when the entire bathroom is only 9' long by 5' wide. I'll be taking a print out of this and making one soon to help move stuff around my garage. what??? No power steering and motor? I move ply in that manner too. I got so lazy that I rigged a pulley to the ceiling to lift it to the saw. Actually it's a super way to hoist it because it goes up and sets down nice and gentle. Hey~!!! It's a hobby~!! It's not supposed to make sense.